A 23-year-old woman was beaten, robbed, and assaulted by a man who followed her from the Damen Blue Line station early Sunday, police said in a bulletin Tuesday evening. The man trailed the victim for several blocks before grabbing her and pulling her into a gangway in the 1600 block of North Bell around 3:25 a.m., authorities said. The woman was beaten, robbed and disrobed by the man in the passageway. 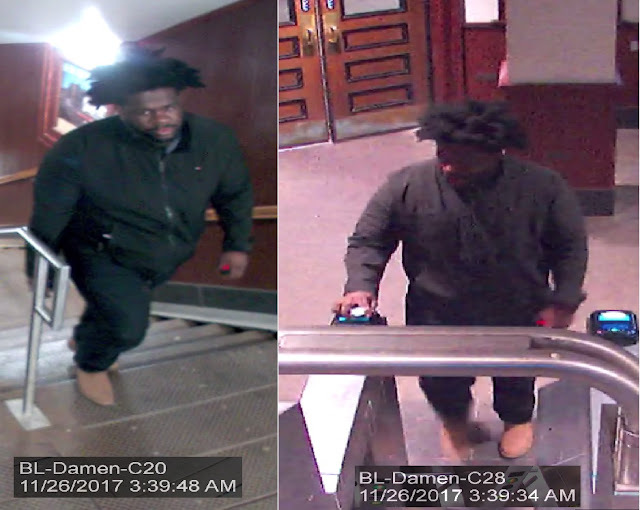 A source said she was still unclothed when a passer-by discovered her around 3:40 a.m.
CTA surveillance images released Tuesday night show the suspect entering the Damen Blue Line station after the attack. Police said the offender is black, 20- to 25-years-old, 5’7” tall, and 150-160 pounds. Anyone with information about the man is asked to call Area North detectives at (312) 744-8263.